I have been waiting and waiting to make a post about this next project. It’s been done for awhile, I just had to give the gift to its recipient before I posted about it! One of my good friends from college is expecting a baby boy in May. She was in my wedding and I was in hers. 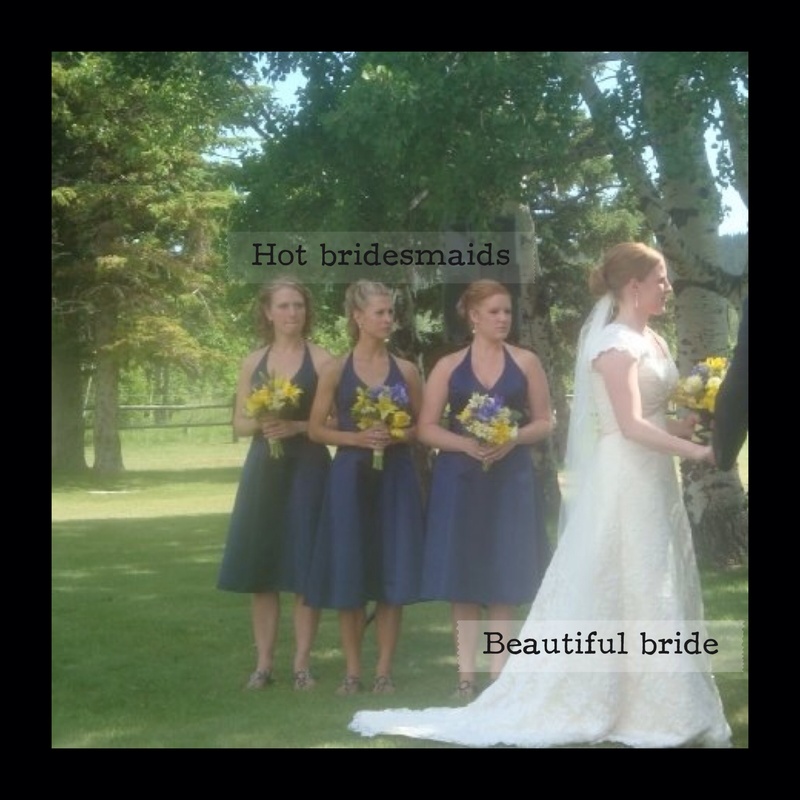 I have always wondered what people do with their bridesmaid dresses after the fact. You have every intention of picking a cute dress that you will wear again, but for some reason, said dress just hangs in the back of the closet and collects dust. Enter Pinterest. That place is great for ideas. I am hooked. I look at pins every couple of days. I kill time with Pinterest. I am not sure if I even pinned what I ended up doing, but mental notes were taken. Great pin: up-cycling your bridesmaid dress into a baby quilt. I was all over it. I hadn’t really gotten into quilting too much before kiddos. I really didn’t have patience for it. Now, however, I am loving the fact that I can start a project and literally stop at any time. It’s so nice. Start nap, go sew. Nap ends, quit project for today. Yes, I’ve been a little selfish with the office/ sewing room. It’s a disaster most days because of my half-completed projects and general sewing clutter. But, and it’s a big BUT, I don’t have to set up and clean up mid-project. It is such a huge timesaver and keeps my “me time” creative, when I want it to be. Back to the project. Bridesmaid dress turned baby quilt. I had to steal that pic from Facebook. It really was a great dress. Every time I tried it on to wear it again potentially, I still felt like a bridesmaid. Hence the upcycle. I decided on a simple log cabin quilt design, that eventually got a bit more elaborate as I went. It turned out so nicely. 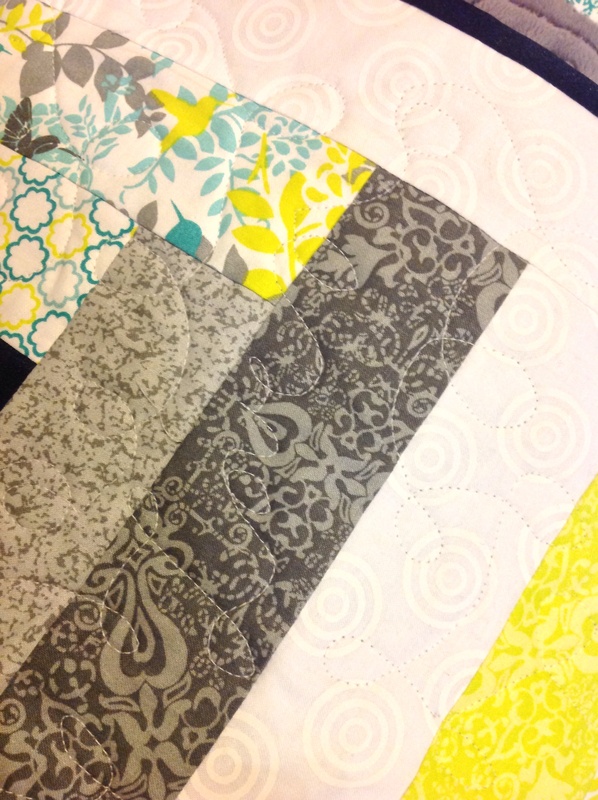 A bit too nice for a baby quilt…. The dark blue centers in the log cabin are 5″ squares of my dress. The small 2.5″ squares are also from the dress as well. The turquoise, green, and gray are from a jelly roll from JoAnns. 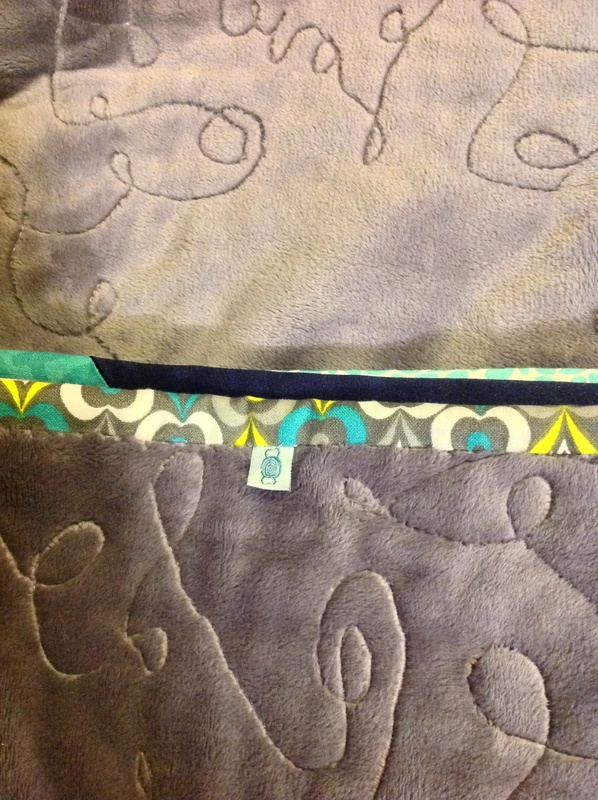 The dark gray minky is from the Sewing Palace in Helena. I free-motion quilted the design of the quilt. 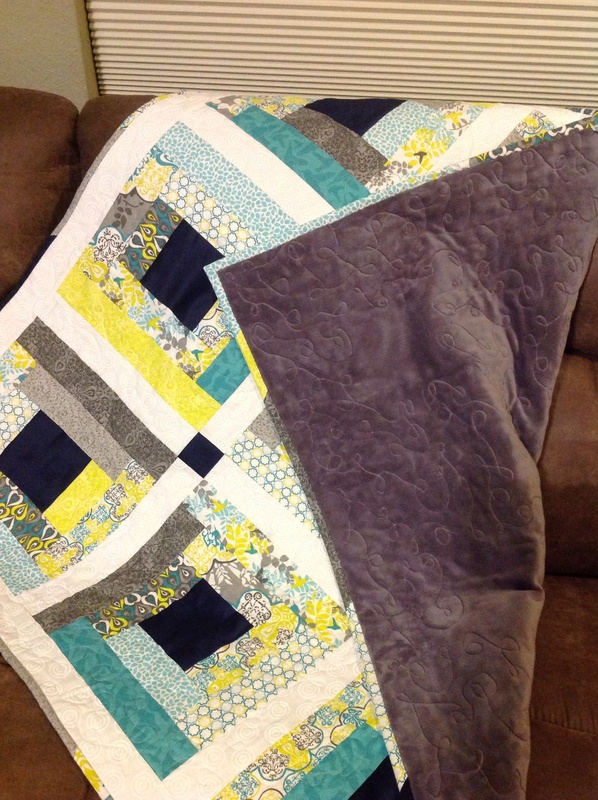 It’s mostly just a series of freehand loops, but I did take the liberty to quilt in “Love” on occasion. Of course, I added a small Seweet Tooth label in the binding! I machine sewed the binding on the front, but ended up hand sewing it on the back to give it a bit more of a polished look. The binding itself was made from extras from the jelly roll. Another project done! 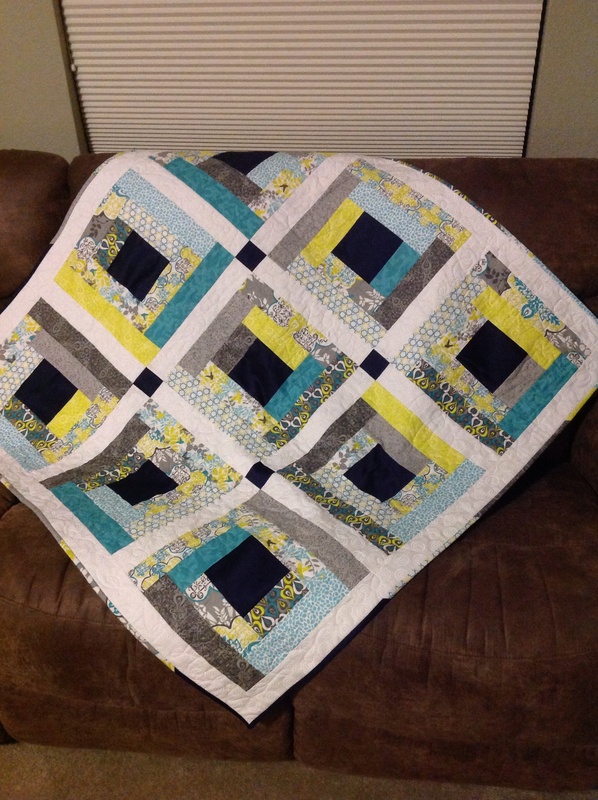 I am looking forward to making the quilt for Garrett that I didn’t get to before he was born! Having seen the project from start to finish, I must say, I am most impressed. As for the mess in the office/sewing room, I’m pretty sure it’s anti-American to have a perfectly clean house if you have children. This is what I’ve heard, of course, but never seen a law about (yet). Well done on this project. Well done indeed.